We’ve all heard of and maybe even experienced a sprain or a strain. Do many know the difference? A sprain is defined as a stretch or tear of a ligament. A strain, on the other hand, is defined as an injury to a muscle or tendon. Sprains can result from a fall, a sudden twist or a blow to the body that forces a joint out of place, while a strain can happen from twisting or pulling a muscle or tendon. Medical Thermography has been shown to be useful as a diagnostic tool in the differential diagnosis of neuromusculoskeletal injuries and their prognosis for return to participation and/or competition. 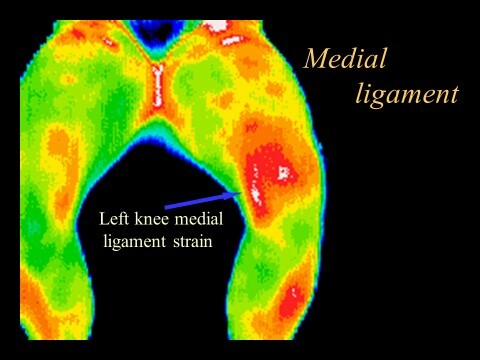 Since Medical Thermography is noninvasive, risk-free, and portable, it is a very practical tool in the clinical setting and may be used in the sports medicine clinic, private practice or the training room to assess injury and make clinical decisions. Medical Thermography not only helps confirm a diagnosis, but can be used as a gauge to clinically assess progress and treatment response of Acupuncture, Chiropractic and even herbal therapy. 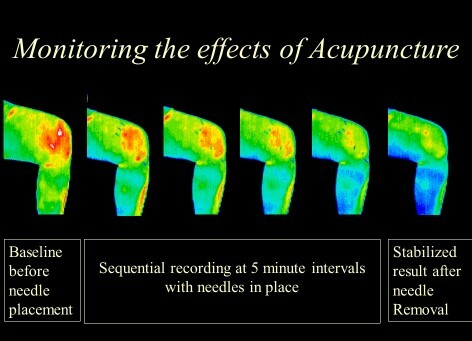 Studies at Carolina Holistic Health LLC involving Thermography guided Acupuncture versus Acupuncture alone revealed a quicker response time and decreased number of treatments needed to heal a number of different injuries and ailments when compared to Acupuncture alone. Medical Thermography has been recognized as a viable diagnostic tool since 1987 by the AMA council on scientific affairs, the ACA council on Diagnostic Imaging, the Congress of Neurosurgeons in 1988 and in 1990 by the American Academy of Physical Medicine and Rehabilitation. A number of studies have been done to determine DITI’s inter-examiner reliability and validity. A study of Medical Thermography in low back pain patients found 96% inter-observer reliability. In a study of patients with knee pain, 98% test efficiency and 94% inter-rater reliability was found. Instinctively, when a person experiences a sprain or a strain, learned first aid skills take over. Things like taking the pressure off the joint, raising the joint and applying ice to alleviate swelling and inflammation are all great places to start. Icing a sprain or strain is only good for the first 48 to 72 hours, as it will help decrease swelling. However, prolonged use of ice may impair movement and also interfere with the healing process because it constricts the tissues and impedes blood flow. Traditional Chinese Medicine practitioners use acupuncture and other modalities to help loosen up the muscles and increase blood flow to the area, which brings in tissue-healing oxygen and nutrients. Increasing blood flow is just one way Traditional Chinese Medicine can help. There are also specific acupressure points that reduce swelling, decrease inflammation and alleviate pain. 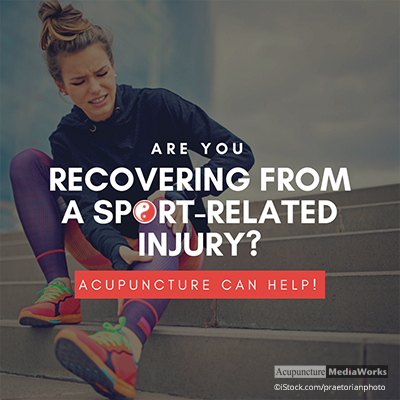 Through the use of regular acupuncture treatments following a sprain or strain injury, the body can heal faster.